DJ and producer Steg G is a monumental figure in the Scottish hip hop scene. 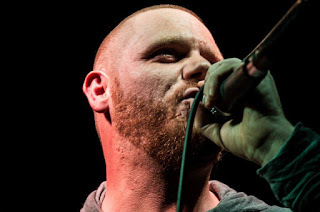 Not only does he invest time running workshops across the city, but he is also one of the only people to actively promote local talent via his weekly Temple of Hip Hop show on Sunny Govan Radio. It's therefore unsurprising that respected names would travel from across the country to perform at a free fundraising event for the station, which also operates as a charity for young and vulnerable people. Although it's a humid summer night, a mix of hip hop heads and passing locals pack out the clammy Box pub on Glasgow's Sauchiehall Street. Opening act K9 Kev & Rory O'B travel all the way from Oban to play alongside Steg, who serves as DJ for each of the five acts performing tonight. Fresh off a heroic festival performance, they seem a tad ill suited to the more intimate setting. Their folk-influenced beats fail to cut through the venue's poor acoustics, but they make up for it with a mix of self-effacing humour and geeky charm. 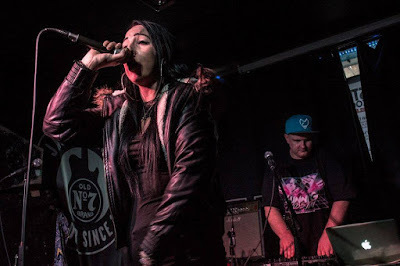 Local emcee Empress might be the least experienced rapper on the bill, but she possesses a confidence and natural delivery that makes her set one of the highlights. She's slightly limited by the fact she primarily raps over 90s boom bap instrumentals from classic Wu-Tang Clan and Big Pun tracks. However, she has such a strong flow and grasp of how to construct rhyme schemes it doesn't overly matter. In a scene where women are underrepresented and misogyny is still prevalent, it's refreshing to see her boss the stage with consummate ease. Edinburgh-based Conscious Route knows how to make his presence known, too. After steamrollering through a selection of his 'Conscious' material, he slots on a luchador mask for his other persona Stutter Jack. Think an English MF Doom with a taste for reggae and you're on the right path. But it's hometown veteran Loki who makes the biggest impact. As he takes to the stage there's an observable difference, and the crowd are transfixed by his absorbing social narratives – at least until he snaps them out of it with a trademark political rant. Regardless, he brings clarity, experience and a selection of beats that just places him a cut above his peers. The majority of tracks he performs are mostly from his lyrically dense new album 'Trigger Warning', but raps them fluidly as his older material. Despite officially launching his new record 'What is Happiness? ', headliner Wee D's casual demeanour suggests he's about as inebriated as half the crowd at this point. He causes a mini-ruckus, going 'taps aff' by the climax of his set and inviting the crowd on stage. There's also a serious side, though. Many of the tracks from the album deal directly with mental health, which he communicates through stories rather than preachy messaging. Dedicating one piano-laden track to 'the fathers in the room', he keeps the room on side and ends the night in a surprisingly touching manner. In fact, given the diversity on show, positivity and community spirit are about all the the five billed acts have in common. For all hip hop can be portrayed as overly confrontational, it has the potential to make for an incredibly unifying spectacle – especially when Steg G is involved.